A place for good music and good coffee, organized in 2004 to support charities from local to national to global needs. A monthly event managed by a crew of students from North Attleboro High School, in collaboration with Oldtown Church. If you would like to perform, contact a member of the coffee house crew! Text/call us, or just write on this wall! - If you would like to perform at a CERTAIN TIME, you need to speak to us DIRECTLY and BEFORE the Coffee House. - If you would like to perform more than 2 SONGS, please get permission from us BEFORE. - If you are not able to make the Coffee House after already signing up, tell us BEFORE. Post by The Coffee House at Oldtown. Like & Share the Coffee House at Oldtown page! 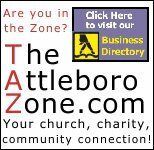 We are the First Congregational Church of North Attleborough, a spirited congregation in the Congregational tradition and with standing in the United Church of Christ denomination. Founded in 1712, we were the first church of the Attleboros and our history is seen in our 1828 Meetinghouse that is on the Historic Register. Every spring, hundreds of school children include the Oldtown Church on their historical tour of the town. They sit in the pews with the little doors, marvel at the original globe lights and get tickled by the Tithingman's stick. But we’re much more than a museum! We meet for worship and church school every Sunday and serve our community in many ways. The Oldtown suppers and the Oldtown Fair are well-known. But it is our spirit of hospitality that marks our church as a special place. You will find a wonderful welcome here. We take seriously the Bible's admonition to "show hospitality to one another... serve one another with whatever gift you have received." In serving Christ we find a wonderful joy and an extraordinary fellowship. We see and feel the Holy Spirit among us as we strive to be faithful disciples of Christ. We are informal and family oriented, yet maintain the reverence of our reformed tradition. Come to worship some Sunday. Bring the children to Church School. Come sing in our choir, or play the handchimes. Be part of our prayer-life. There is a place here for you... a pew with a little door on it waiting for you to open it.